Welcome to the New Oath: Ad Glossary for download and installation on your Mac! 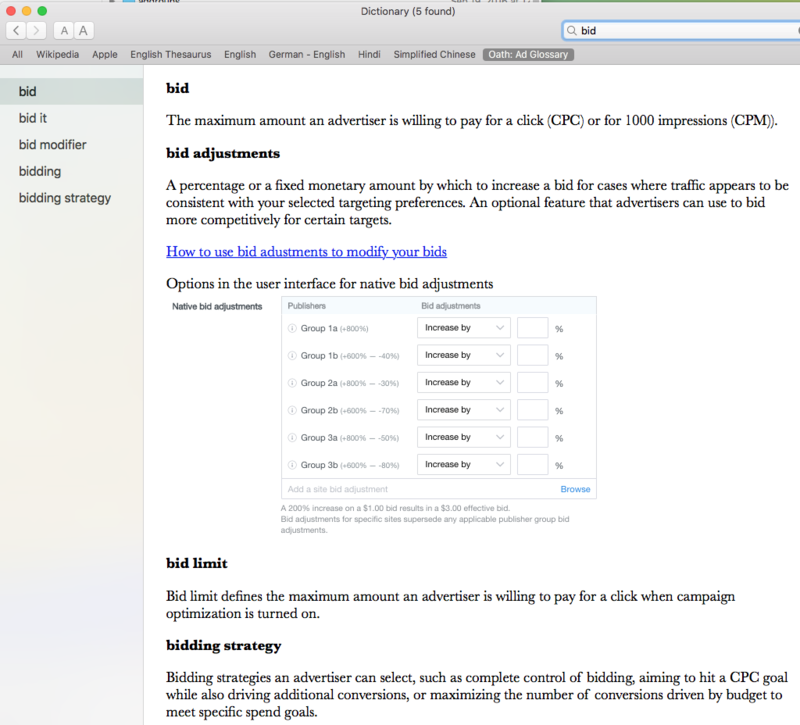 This is a unified advertising glossary, built and implemented as an addition to the Apple Dictionary.app that resides in every user’s Applications folder on Mac OS X. As a glossary, it includes a set of terms, illustrations, videos and embedded hyperlinks that are unique to the Native & Search API, UI and to the Oath: Ad Platforms DSP. The goal is to provide Oath account managers, partners, developers, product managers and Oath self-serve members with a set of terms that are useful for understanding and working with the Oath ad platform. Note that the Glossary is only available currently for Mac OS X. Future versions may include Windows, and mobile versions for iOS and Android. Note that a new release of the Glossary is now available, as of 09/10/2018. If you’ve already installed the v1 or v2 version of the Glossary (following the instructions below), you can replace it with the v3 version in your Apple Dictionary.app. Simply click Oath Ad Glossary v3.0. You can download a zip of the New Oath: Ad Glossary and install it in the Dictionaries folder on your Mac OS X system. Once set in Preferences, the Glossary appears as a tab in the Dictionary. You can then enter a term in the Search field, and instantly get the definition, along with an example illustration, typically from the UI, plus useful links to the Native & Search Advertiser Guide and the Native & Search API. Using this dictionary when searching for the meaning of a particular advertising term, provides you with a number of advantages. Auto-completes when you search, and enter “bi”. Instantly, it finds bid, and then “remembers” that query, so entering simply “b” returns “bidding” in the Oath: Ad Glossary search results. The Glossary is built to “learn” from your search queries and get smarter each time you enter a letter or word. Searches across all user-enabled dictionaries, e.g., German, Traditional Chinese, and Wikipedia for instances of the word. Captures and displays (by design) multiple instances of the term, e.g., bid, bid limitations, bidding strategy, etc. Enables the user to enter full screen capability, so the user can resize the screen display accordingly and view longer, related lists of the term, in addition to illustrations and embedded hyperlinks. Extensibility and maintenance: quick additions to the glossary can be made, with new word definitions and technical details. A new glossary can be compiled and then posted as a point iteration and available for download and updating. Performs an contextual lookup of a selected term on a webpage. The desired behavior: The user clicks or drag-selects a portion of text in the Native & Search UI, for example, then right-clicks on that text and then looks up that term from the contextual menu. A three-finger-tap on a particular word that has been selected by the user will also work. This section describes the steps you need to follow in order to download and install the Oath Ad Glossary. Begin by downloading this zip compressed file by clicking Oath Ad Glossary v3.0. Download the zip file to your Mac’s Downloads folder (or another folder that you’ve specified for your downloads). Double-click the zip file to open it. Navigate to your Applications folder. Scroll down and you’ll see the Dictionary.app. Click to launch the app. In the Dictionary.app, go to File menu > Open Dictionaries Folder. In the Dictionaries folder. You’ll see a folder named CoreDataUbiquitySupport. Now return to your Downloads folder on your Mac and drag-select the Oath/ Ad Glossary.dictionary file to move it to the Dictionaries folder that you’ve opened. Drop the Oath/ Ad Glossary.dictionary file into the Dictionaries folder. 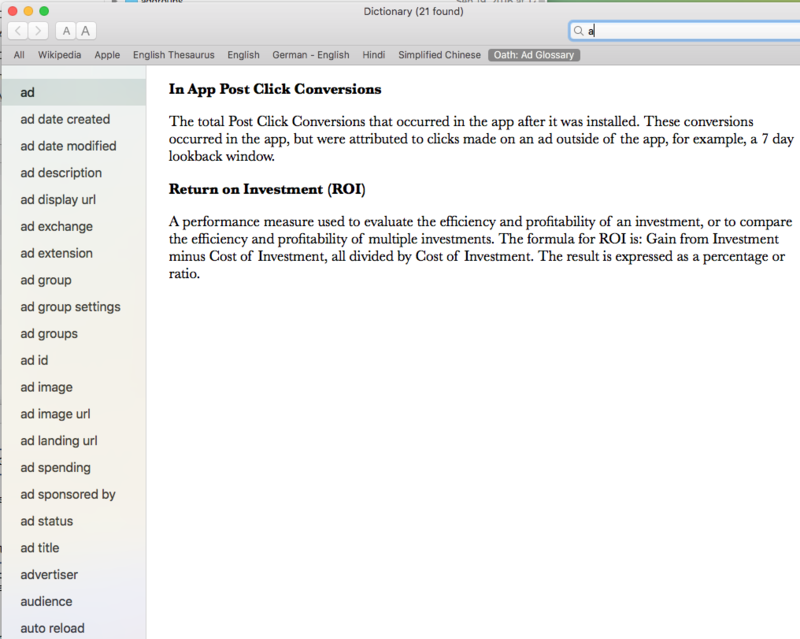 In your Dictionary.app, navigate to the Dictionary menu > Preferences item, and click to open. In Preferences, scroll down. You’ll see Oath: Ad Glossary. Click the checkbox to activate the Oath Glossary. You can also select and move it in preference order in the tabs that include your various dictionaries, like English, German, Hindi, Traditional Chinese, and so on. 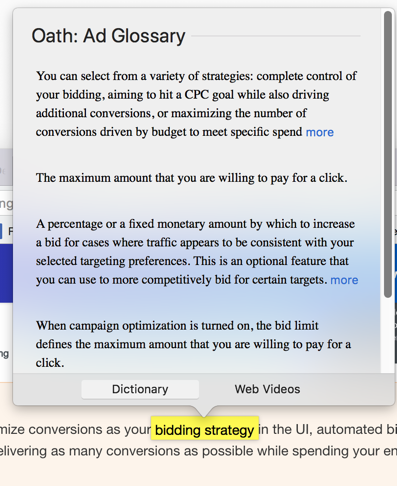 Now you’ll see Oath: Ad Glossary in the tabs at the end with All Wikipedia Apple English Thesaurus. Enter a term in the Search field. The Dictionary improves its searching capability the more you look up certain terms, so that it auto-completes a term with a simple one letter entry in the Search field. 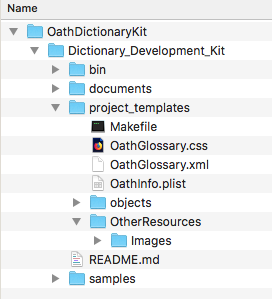 The master file for the Oath: Ad Glossary resides on the Mac OS X system of the Editor for Native & Search API and Native & Search Guide technical content in this directory. The XML file is the main source of truth for the Glossary, enabling you to enter new terms with definitions in XML format. The footprint of the Glossary (as a .Dictionary file) is small: only 1.1 MB right now, with inclusion of almost all the terms in the existing Native & Search Glossary in the Native & Search Advertiser Guide, plus some screenshots, illustrations and links. Send feedback to Tom Maremaa <maremaa@oath.com>, Principal Technical Writer for Oath: Ad Platforms. A special Glossary Workshop page is also available, where interested parties can contribute new terms to the glossary and provide valuable input on usage and address any technical issues that may arise as the glossary gains wider adoption. Contact Tom Maremaa for access to the Workshop.